Sungrazer by Space Jam is a great e-juice which is perfect for vaping at any time of the day. Space Jam is one of the best vape juice brands around. The company makes some otherworldly e-liquids. The company, which based in the United States, uses the finest ingredients to create its e-juices. Sungrazer is a mouth-watering vape juice. You will be pleased with each puff. There is a pleasant sweetness to this vape that lingers in the mouth. If you like e-liquids that have a consistent taste, then this is just the one for you. 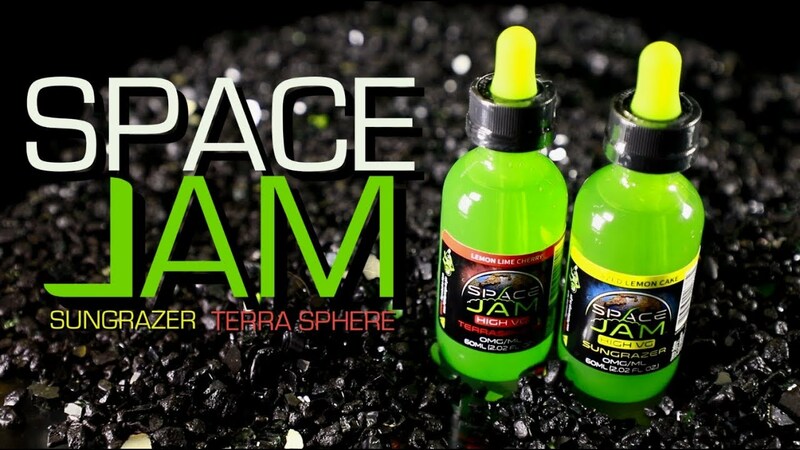 Sungrazer by Space Jam has the flavor of a lemon cake. It is sweet and tangy with a mild taste. When you open the bottle, you get a nice aroma of lemons. On the inhale, you get the flavor of fresh lemon cake. It is creamy and smooth. This is a very enjoyable dessert vape that you will want to reserve for only special occasions. You can taste the lemon flavor in this e-liquid distinctly, but it’s not very sour. It is quite pleasant on the taste buds and leaves you wanting more puffs. The flavor is quite light like a real slice of lemon cake. The vegetable glycerin (VG) and propylene glycol (PG) ratio of Sungrazer by Space Jam is 70/30. You can vape it by using a tank or a dripper. If you want to indulge in the flavor of this e-juice, it is best to vape it using an RDA. There is a good balance of cloud production and flavor in this Space Jam e-liquid. If you buy a bottle of this vape juice and you are not quite satisfied with how it tastes, you can leave it to steep for a few days. Steeping allows the different flavors to mix well so you will get the true taste. The cloud production of Sungrazer is huge. It will give you the sort of giant clouds of vapor that will delight cloud chasers. The clouds that you get from this e-juice have a nice aroma and linger in the air for some time. Sungrazer is available with different nicotine strength levels. You can get this e-liquid with either 0 mg, 3 mg or 6 mg of nicotine. You will get no throat hit from the version of this e-liquid with 0 mg of nicotine. This version is perfect for vapers who want to savor the flavor without any throat hit. If you want a strong throat hit, you may have to go for the version of this e-liquid with a higher nicotine level. Sungrazer by Space Jam comes in a 60-ml bottle with a simple, minimalist packaging design. The e-liquid is packed in a clear green bottle with a dropper cap. There is a label on the bottle with the Space Jam logo and some other information about the product. If you need to buy the best e-juices on the market today, you need to head over to smokingthings.com. You will find many Space Jam e-liquids on sale at this store at great prices and discounts. A 60 ml bottle of Sungrazer is selling for just $19.99 at this store. Smoking Things provides excellent customer service and speedy delivery of orders. Sungrazer will give you a memorable vaping experience. When vaping this e-juice, you won’t pick up any weird artificial flavor. The flavor matches the flavor description to the letter. I recommend this e-liquid to all lemon lovers. On a scale from one to ten, Sungrazer could score a nice eight from me. This e-liquid is worth the money. You may want to buy a couple of bottles because it is quite easy to get hooked on it. It’s like a David Bowie song, which you cannot help but rock to endlessly to.